I'm man enough to give credit where credit was due. Zetterbug had a fantastic night singlehandedly taking down our beloved Pens. 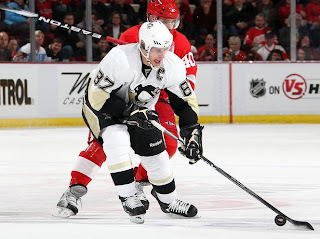 Assisting on the first and tallying the final two goals proved to be too much for the Pens in the Joe. At the beginning of the game we found a quality battle on both ends of the ice. The Pens took some untimely penalties in the first, but the PK headed by the strong netminding of Fleury held Detroit to no powerplay goals. Though unfortunately after a grueling first period Valtteri Filppula found the back of the net with less than a minute to go to make it 1-0. It was quite evident by the timing of the goal that it flattened the Pens and grew the confidence of the Wings. Starting the second period it was all Detroit. The offensive pressure of the Wings kept the Pens on their toes for the first 10. All the Pens could do was try to contain and Datsyuk and company away from MAF. While that worked initially it was only a matter of time before Detroit was going to strike again...and they did. Zetterbug found a freebie in front of the net after some traffic stymied Fleury, 2-0. 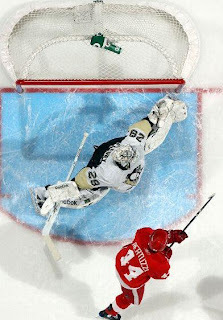 However it was at this point where the Pens finally broke their silence and changed the flow and momentum of the game. Offering their own version of "pressure" they ended up grinding a goal of their own out. After a dump in the zone by Dupuis (one which I criticized wasn't working), Kunitz found himself in some great position and with the puck in front of Jimmy Howard, Kuni and Dupes chopped a goal in cutting the lead to one. Start of the third appeared to be fairly even, that was of course until Zetterberg struck for his third time. Knifing his way through the neutral zone past two players he rifles a 40 foot wrist shot over the glove of Fleury. And that about did it. Pens had a chance midway through on a powerplay but couldn't connect. Fleury had some of the best saves of the year in this game, but couldn't withstand the onslaught the the Wings brought. They wanted revenge, they wanted blood. They got their win, yet still sit in the eight spot in the West. Surely this will boost their confidence. If they get in the playoffs they'll for sure give any of their opponents a run for their money. Can't count them out. Well, they played their type of game at times. We saw some great scoring chances, but Howard was exceptional in net. They also hit quite well and played very physical. Fleury likewise had some of his greatest saves of the season, particularly in the first period. The penalty kill also did well and killed off all four of the powerplays for Detroit. What I saw the most problematic were the turnovers. Sure the Wings forecheck contributed to this, but Letang, Leopold, and Orpik had several plays where they turned the puck over not only in the neutral zone but also in the Pens own zone. The Pens also lost a lot of battles along the boards. Countless times did I see the scrums end up in Detroit's favor. Sid seemed to do okay though ended up with no points and a minus 2 on the night. I didn't like Fedotenko on the top line with him and Dupuis, but with Geno out sometimes your options are limited. I also felt Poni had a bad game. Seemed himself to turn the puck over a few times. Finally, Jordan Staal...bad game. I'm not a Jordan hater, but sometimes guys just have bad games. He went 7 for 19 on the draw and didn't get a shot on goal. I can't express how important the faceoff circle is in a game like this. And Staalzy is one who usually has a big game against the Wings. He did play well on the pk, that's for sure. Overall the loss was just a matter of getting out dueled. The Wings played better, plain and simple. When the pressure is on you have to respond. The goal by Dupuis wasn't the prettiest, and as such we didn't see another go by Howard the rest of the night. Likewise I thought the first and third goals Fleury let in could have been avoided, but otherwise he played exceptional. You can't really blame him for the loss as much as you have to give credit to the Wings. Would the game had a different outcome if Geno played, very likely. Number 71 has had some big games against Detroit in the past. But he needs his rest as they prepare for the playoffs. Interestingly Geno has missed 10 games this season and interestingly Sid has failed to score in each of them. Pens are also 3-7 when he doesn't suit up. In Washington on Wednesday against yet another 2009 playoff rival, the Caps. The disappointing loss on that bloody Sunday afternoon on the 7th day of February is surely in the minds of the players. Tired from a long bus ride, up three goals, and Ovi's hat trick to win it in OT...heartbreaking. The boys will be ready.